Statistically, the killings of Biafrans in Nigeria is a daily ritual which commenced far back in 1949 before Nigeria independence and after the amalgamation of the Eastern, Western and Northern protectorate into an entity. After the amalgamation process, the Yoruba people (Oduduwas), the Hausa people (Arewas) consider Biafrans as their problem to milking from the abundant natural resources in the land; as such, they were despised and reduced to second class citizens despite generate over 90% of Nigeria's revenue. This enmity on Biafrans in Nigeria has continued unabated despite how hard they tried to keep Nigeria one. 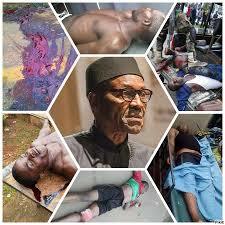 Biafrans are killed massively and secretly in the northern part of Nigeria at any slightest provocation. Again, Biafrans in the Western part of Nigeria are deported back to Biafra for no just cause. These and more are the cruelties unleashed on Biafrans in one 'rotten Nigeria'. Read also:BIAFRA: AMID AMNESTY'S REPORT, BRITISH MEDIA BACKS BIAFRA GENOCIDE. At the sphere of politics, Britain designed Nigeria to favour the North and enslave Biafrans via provoking political and administrative lopsidedness. Biafrans are denied equity, justice and fairness; they have been isolated, denied and rigged out. Seeing these intended extermination, systematic repression, oppressive activities and the unending effort to fit-in to "One Nigeria" ideology that has proved futile, Biafrans have chosen the path of self-determination. This decision led to the massacre of over 3.5 millions souls in 1967-1970, excluding pregnant women and children. Women were raped, children were starved, relief camps were bombed; the entire world rose up against Biafra. The war ended on paper but the genocide has continued; these happenings and it's continuation has again given rise to the recent agitation for the restoration of Biafra, led by Mazi Nnamdi Kanu. In Kanu's bid to preach this message to Biafrans, he was kidnapped by the Nigerian government, falsely accused of treason, tortured and illegally detained against two court orders since 14 October 2016. As a result of Kanu's incarceration, there has been peaceful protests/demonstrations in demand for his release. Though these demonstrations were carried out in over 90 cities of the world, the demonstrations in Biafra have claimed the lives of over 2000 Biafrans since August 2015. The "trigger-happy" Nigerian soldiers "rained" bullets on 9 February 2016 at Aba and 30 May 2016 at Ontisha/Nkpor, despite the peaceful approach Biafrans adopted in these demonstrations. After 9 February massacre at Aba, lifeless bodies of Biafran agitators were found in bushes which later investigations proved them to be IPOB members arrested at the prayer ground by the Nigerian army. Some were found in shallow graves and till today many are still missing. Buhari must be prosecuted for this huge blood shed; Burutai, the Army Chief Staff, cannot escape invitation to the International Criminal Court, ICC; and all the South Eastern governors that have allowed these killings on the people they are supposed to secure. Justice must serve and prevail. Buhari, a volunteer advocate for Western Sahara and Palestine, is about to be consumed by his hatred for Biafra. The ongoing investigation on Biafra peaceful protesters' killings must be carried out diligently and all the perpetrators must be dealt with accordingly; today not tomorrow. If the world like, let them keep silent. Nothing on earth will stop Biafra. BIAFRA, OLILE NCHEKWUBE AFRICA NA UWA NILE. One thing I know is, GOD is not oblivion of anything that happens under the sun. HE does not forget anything. One day, HE will remember just as HE did on Amaleks who maltreated HIS people ISRAELITES on their way back from Egypt.